Bhagavad Gita along with the Upanishads is regarded as the authoritative scripture for Hindus. However the size of the Bhagavad Gita-it has 700 verses-precludes its complete recitation, let alone study by most persons. 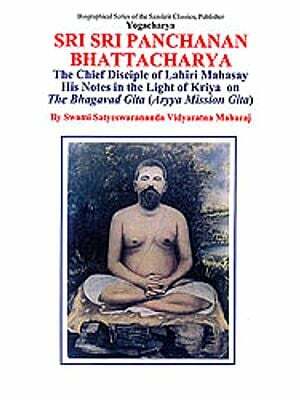 The popular understanding of some of the oft-quoted verses of Bhagavad Gita do not do justice to the deep contents of Gita. Thus there is a long standing demand for an edition of Gita having about one hundred verses. This demand has been specially expressed by school teachers who want to teach Gita to children in their spare time. The current edition is our response to such needs. It has 126 verses along with their meanings. 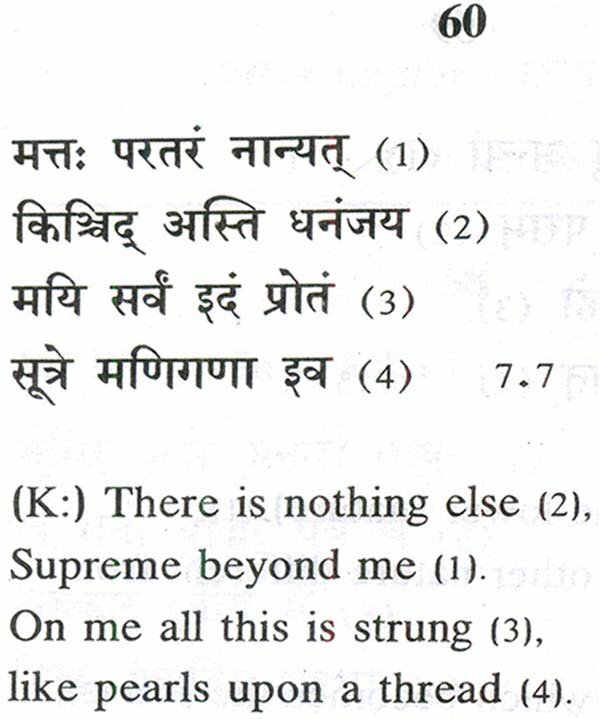 1) Format: Each verse is divided into 4 parts (or pada). 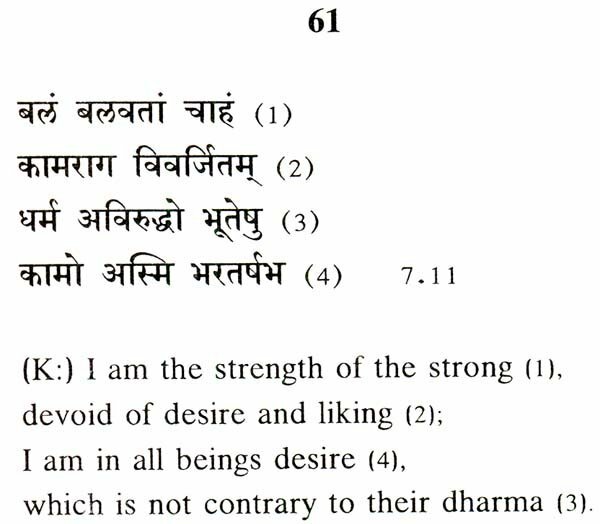 The meaning of each part is given separately; each pada is short and has only 3 to 5 words. 2) Sanskrit background: No prior knowledge of Sanskrit in any form is required. 3) Recitation: user friendly handling of compound words. 4) Recitation time: about 25 minutes. 6) Coverage: All the major ideas in Gita are covered here. 7) Utility of the recitation for all including secularists. In the beginning, teacher may focus on one pada (or part) of the mantra. Note each pada (or part) has only 4 or 5 words; It is easy to recite and to remember each pada. Then the teacher can focus on one shloka. This book has solved one of the great difficulties faced by students (and teachers) in pronouncing the compound letters involving 3 consonants. We have found in classes that most students have no difficulty in pronouncing त्यकृत्वा or कृतस्न; it is unfair to blame the students, or data entry persons. The problem lies with the editor who prepares the manuscript. In the beginning, focus on each pada of the verse till the students get competence. During this phase, the teacher may recite first followed by students. After some practice, 5 verses can be recited in about one minute. Thus the text requires 25 minutes or less for recitation. Here the meaning of each pada (or part) is given directly. Thus both the text and translation of each verse has 4 lines. Since each pada has 4 or 5 words, some diligent students can guess correctly the meanings for the Sanskrit words. Thus these students are learning Sanskrit also in addition to Bhagavad Gita. All the 700 verses of Gita fall into several groups, each group having a basic idea. So it is possible to get a good idea of the important ideas of Gita by focussing on the key verses of these groups. The 126 verses given here cover all the major ideas. Several empirical studies have shown that students who memorise the long litanies of 100 verses such as this have greater power of memory (of more. than one order) in their later years than the others. You do not have to regard Gita as a religious text to get the benefit. Even otherwise, many persons with great difficulties have benefitted by reading the verses with meanings. Even if a young student aged 12 or less memorises the Gita and stops the recitation, still he can recall the verses with some effort when he/she needs it ten or twenty years later. We hope and pray that the lovers of Gita will come forward to donate copies of this book in bulk (say a hundred copies) so that every student in school and college may possess a copy of Gita. We use these letters in the beginning of translation.